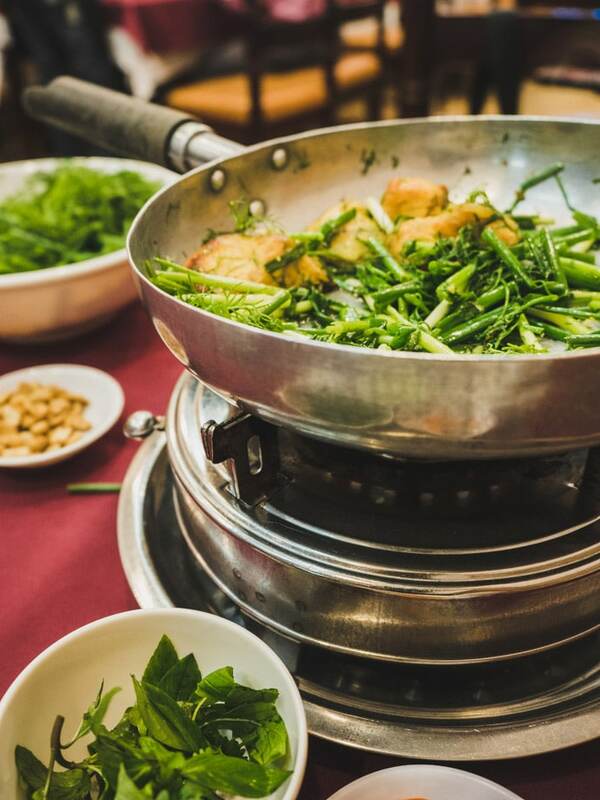 There are so many delicious Vietnamese dishes to try, but the type of dishes you will try will vary from north to south. 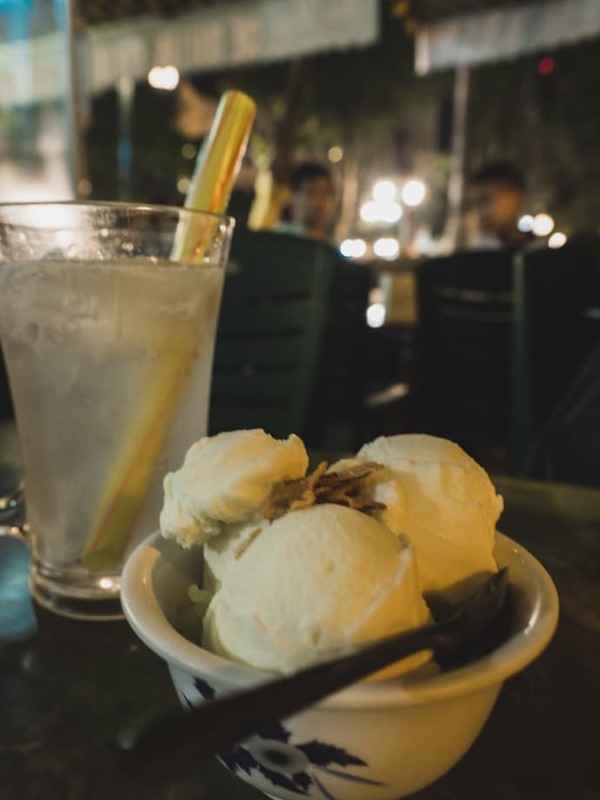 In Hanoi, some of our favourites are Bun Cha, Cha Ca and egg coffee. 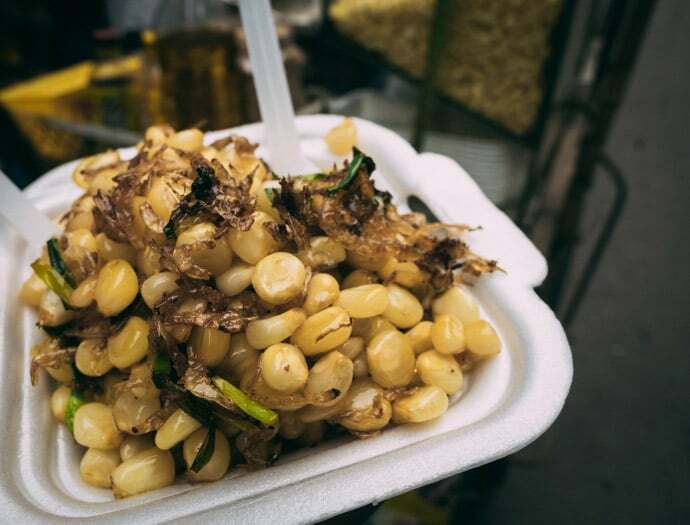 In our Hanoi Food Guide, we go over some of our favourite picks for street food, restaurants, cafes, desserts and drinks in Hanoi. 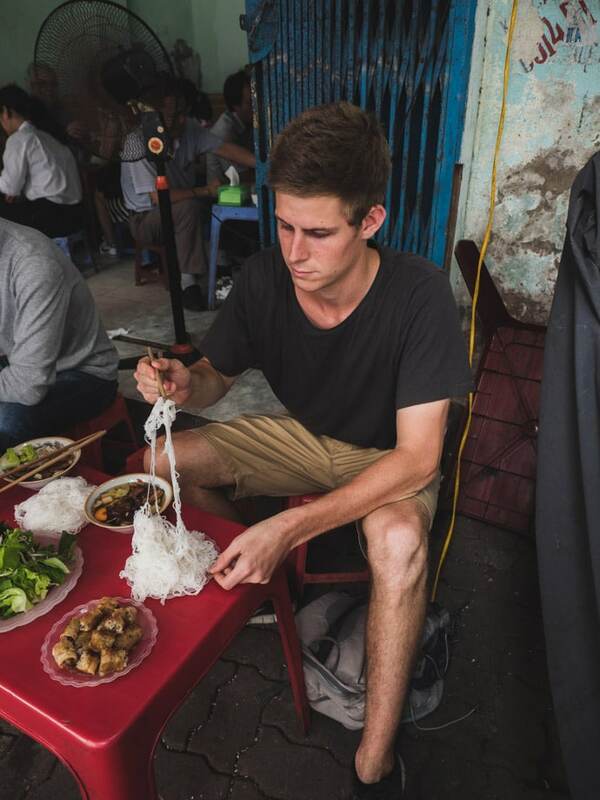 We tried these over three trips to Hanoi, including spending one month there. 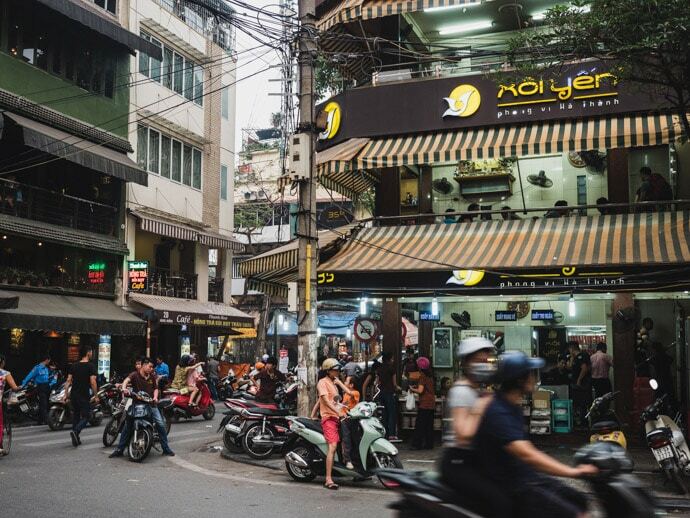 So you can use this guide to help you decide where to eat in Hanoi during your trip to Vietnam. 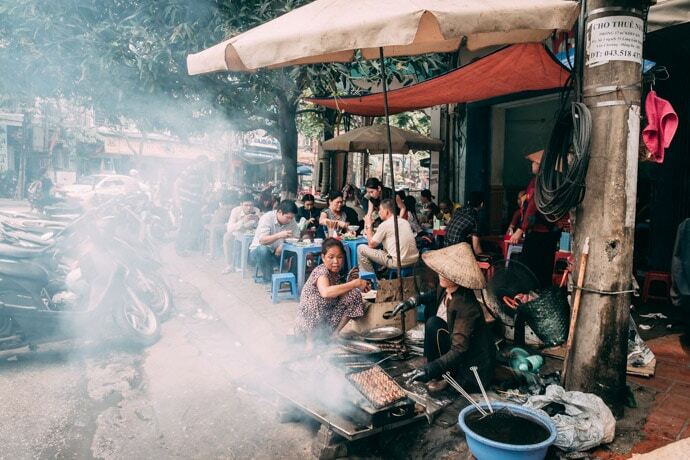 The very first time we visited Hanoi, one of my favourite food experiences was sitting on the street in the tiny little plastic chairs with a mini BBQ in front of us, cooking up our own meat and vegetables. Since then, we’ve been back to Hanoi twice, and each time we make sure to come here a least a few times. Here you will pick your meat and they will bring out the raw meat and vegetables for you to cook on your little BBQ on your table. Part of the fun is cooking it, but come prepared for a little oil splatter. Make sure to ask for some bread, which is best ripped into little bits and cooked in the pan oils. So so good. Our pick for where to eat in Hanoi for atmosphere. 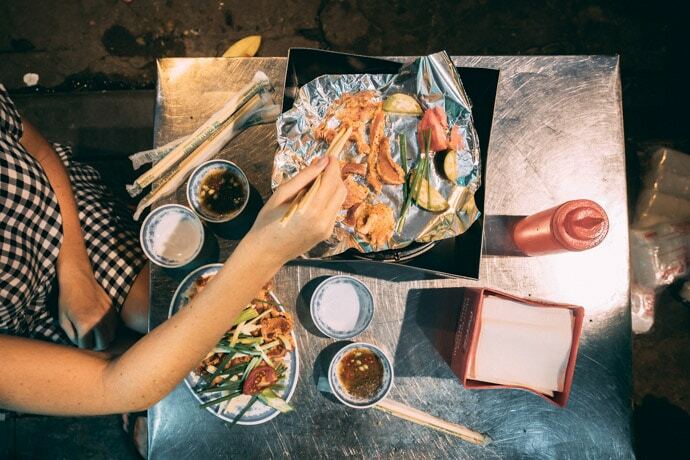 Although not technically just on the street, this casual eatery serves delicious sticky rice. It’s a bowl of sticky rice, with dried mung bean, fried shallots and your choice of toppings. We loved it with corn and pork. The best way to have it is with a side of soy milk. It’s delicious and probably unlike anything you’ve ever had. 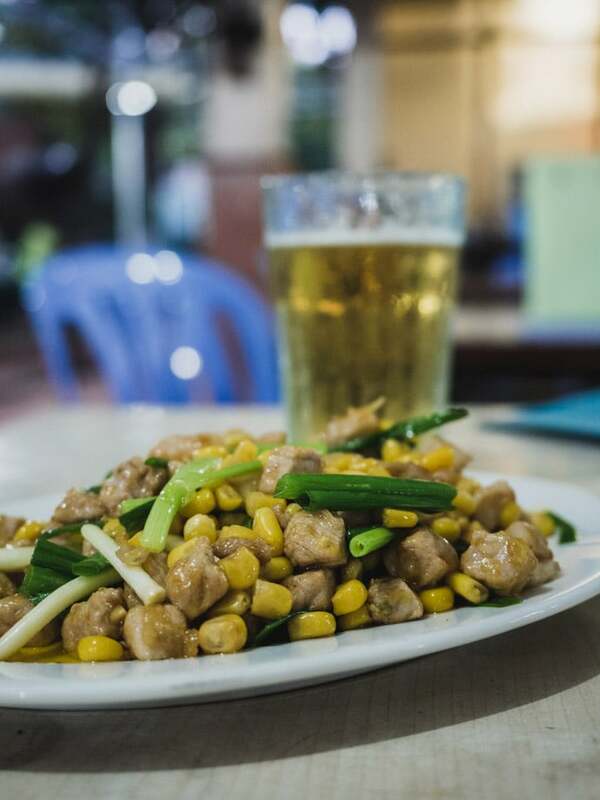 Our pick for where to eat in Hanoi for a unique and tasty dish. 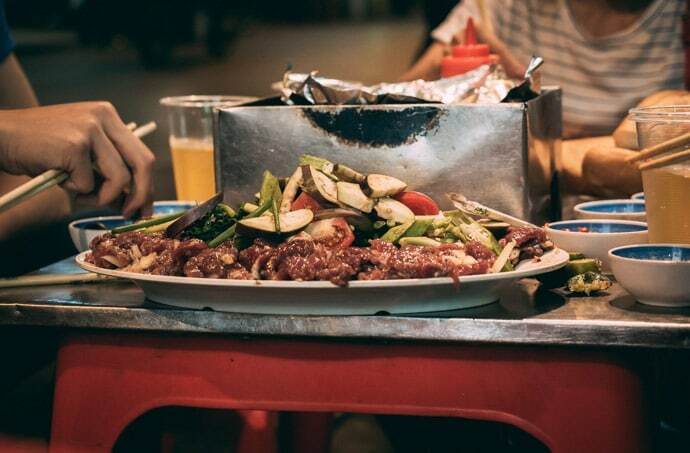 In our opinion, this is some of the best food in Hanoi Old Quarter. 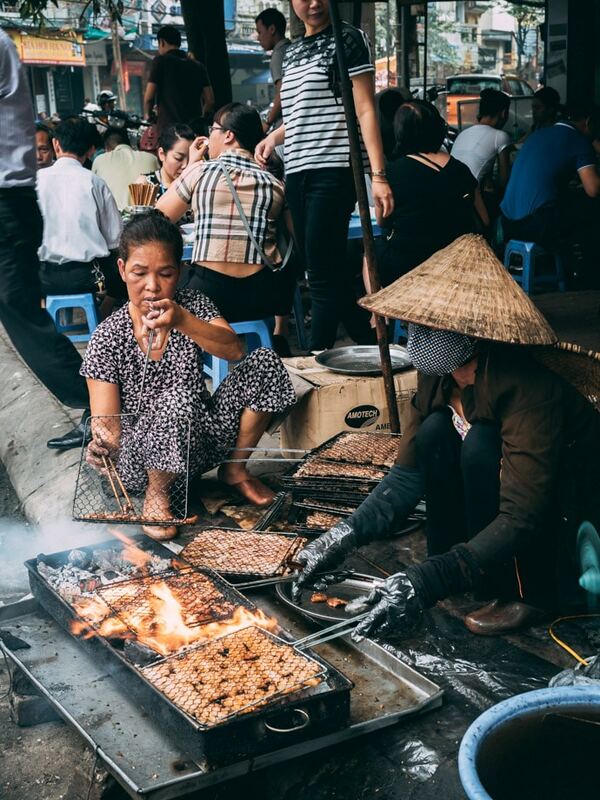 Looking for the best street food in Hanoi? 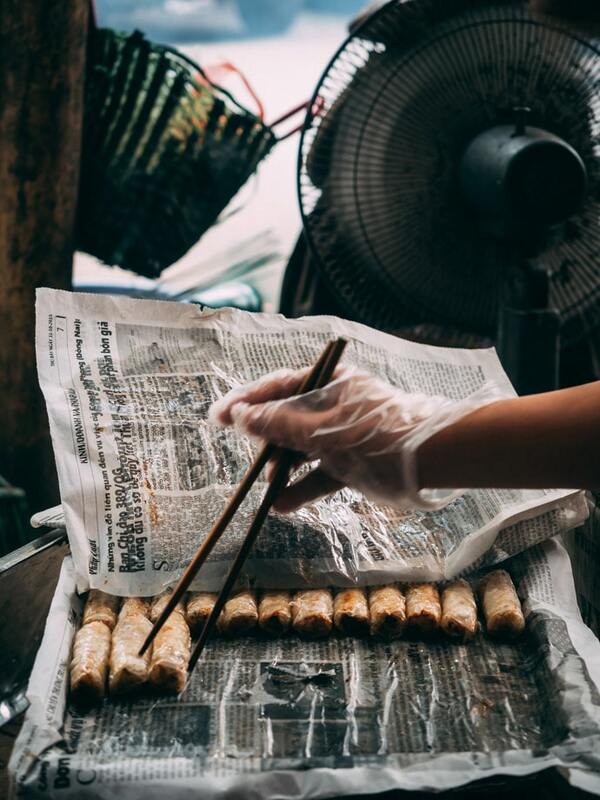 Bun Cha is one of my favourite Vietnamese street food dishes, consisting of rice noodles, grilled pork and minced pork patties, fresh herbs and dipping sauce (Nuoc Cham). 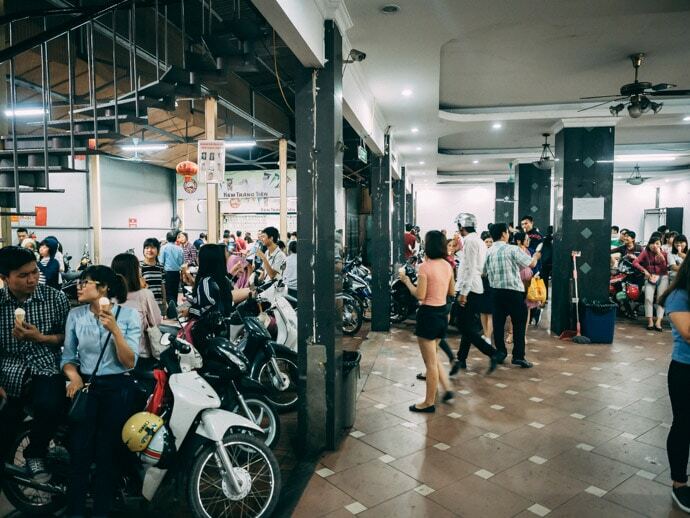 One of our favourite places for Bun Cha can be found at 29 Cau Go street. 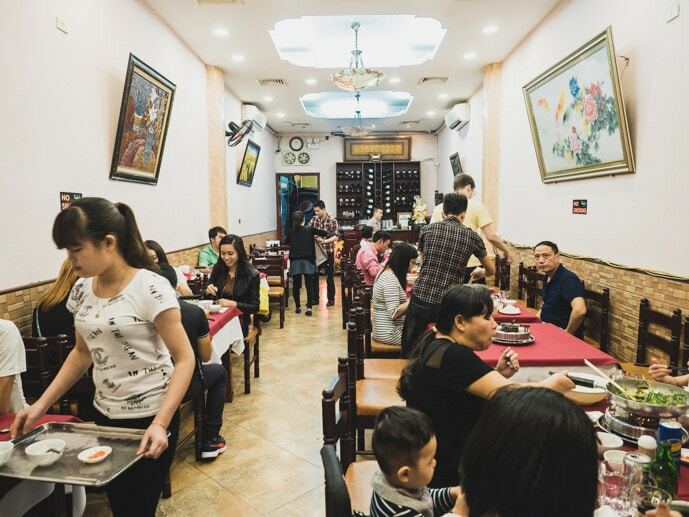 Another great option is Huong Lien, which is actually more of a restaurant. It was made famous by Barack Obama’s visit, which often leads to restaurants resting on the publicity, and although you will be eating with photos of Obama, it is still very tasty. 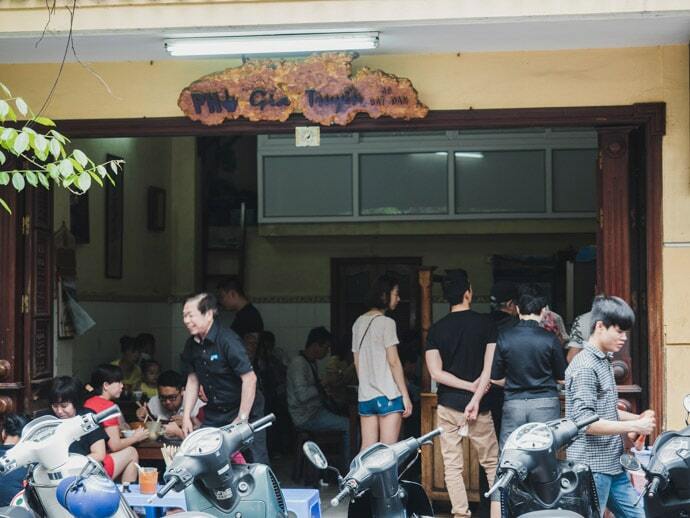 Although we preferred the food at the previous two, for the atmosphere and local feel, the Bun Cha on the corner of Ngô Sĩ Liên and Quốc Tử Giám is worth a visit if you’re in the area. One of my favourite things to have with bun cha is spring rolls. There are so many varieties and all are a little different. Vermicelli with pork or crab is common. Most bun cha places will have these delicious fried spring rolls. 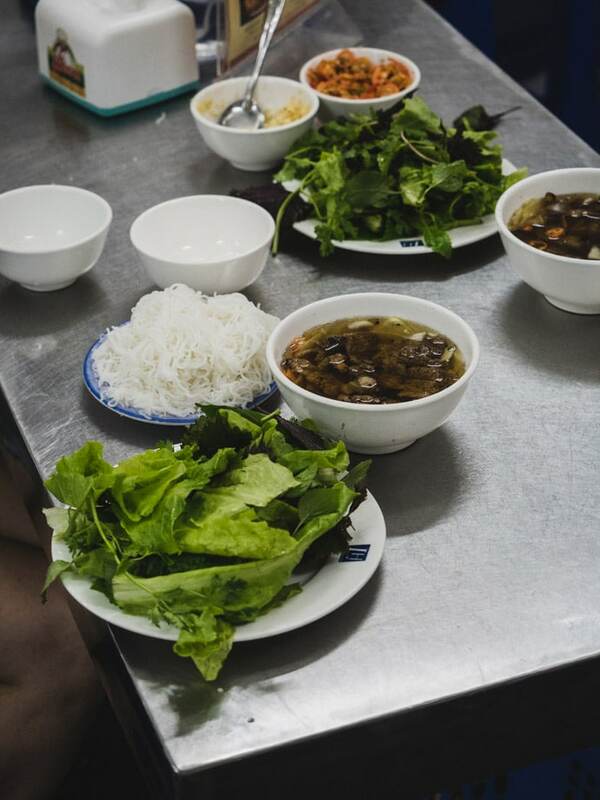 In the north of Vietnam, Pho is much more of a heartier dish than in the south. For me personally, I much prefer the lighter, fresher Pho of the south. But if you’re after a good Pho in Hanoi, our favourite is Pho Gia Truyen. It’s hearty with lots of meat and flavour, and to top it off dip your fried breadstick or banh quay into it. There can be lines, so try to go early. 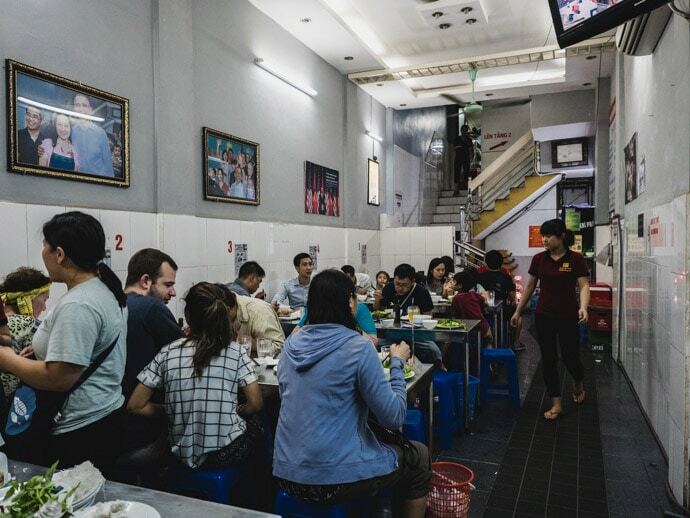 If you’re near the Ho Chi Minh Museum early in the morning, this is another good Pho and feels very authentic mainly filled with locals enjoying their breakfast. 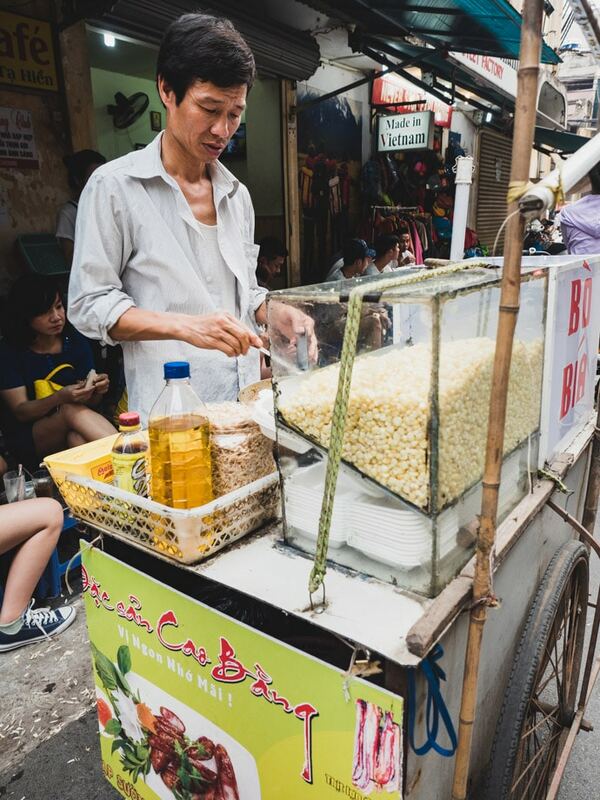 Roaming the streets in a mobile cart you will stumble across a delicious corn dish. In it is usually corn, fish sauce, shallots, dried baby shrimp and chilli. Delicious. One of the best Hanoi food specialities is Cha Ca. This was our first experience of Cha Ca, which is pan-fried fish with turmeric and dill. It’s an old restaurant that only sells this one dish. We loved trying this on our first trip to Hanoi. Cha Ca La Vong is perhaps the most famous place for Cha Ca but it can feel very touristy. Another restaurant specialising in Cha Ca. Cha Ca Thang Long is a nice setting to try this delicious dish. This was our favourite place for Cha Ca that we have tried so far. We found the service here was much more welcoming as well. 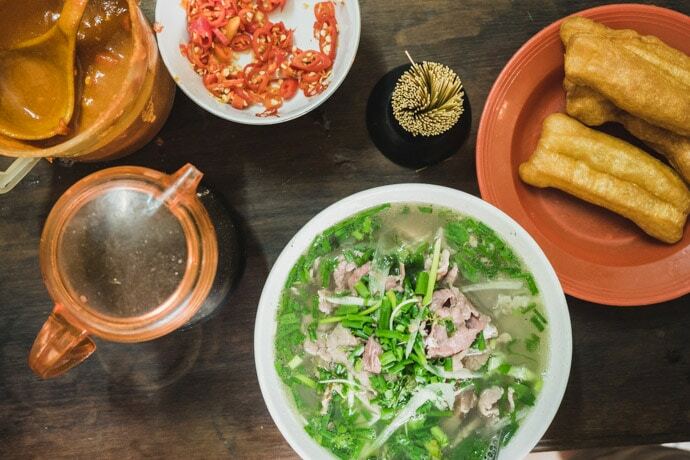 Think of Quan An Ngon as a perfect introduction to Vietnamese food. Here you can try so many different Vietnamese dishes in one place. 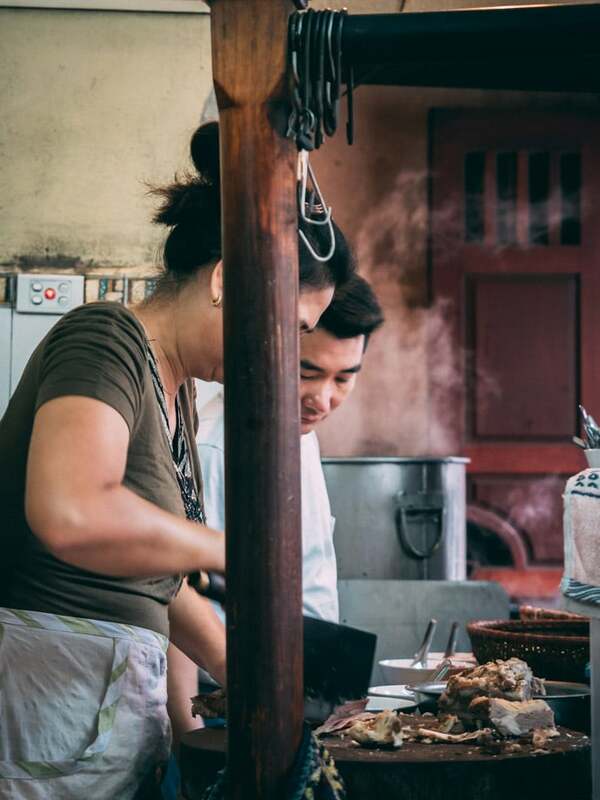 Although it may not be the best version of every dish, it’s great if you have limited time and want to try as many dishes as possible, or if it’s your first time to Vietnam to give you a feel for each dish. 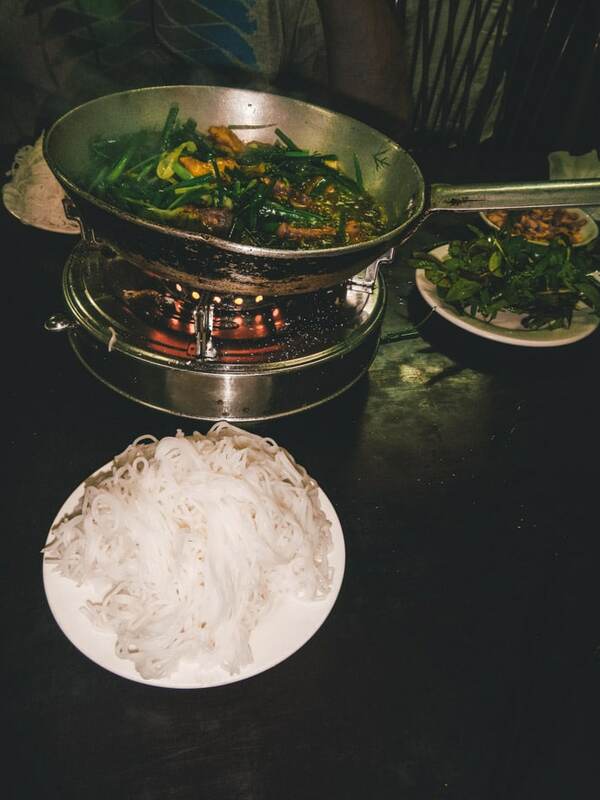 Our first meal in Vietnam was at Quan An Ngon in Ho Chi Minh City. 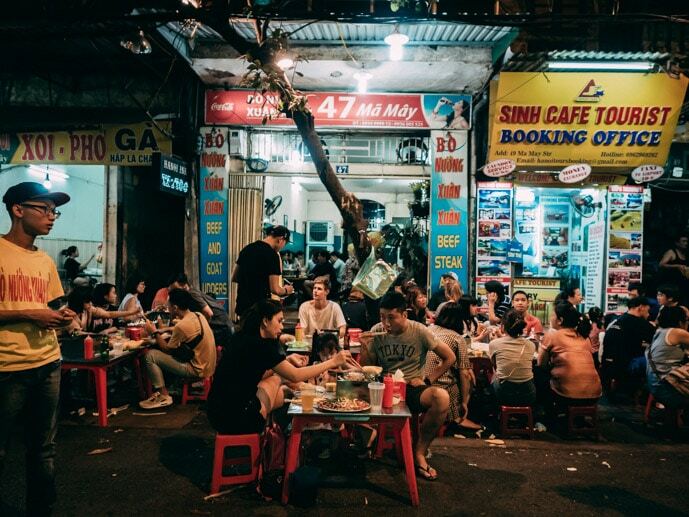 I’ll never forget crossing Vietnamese streets at night, almost giving up on dinner, then finding out it was all worth it, having a Vietnamese feast at Quan An Ngon. 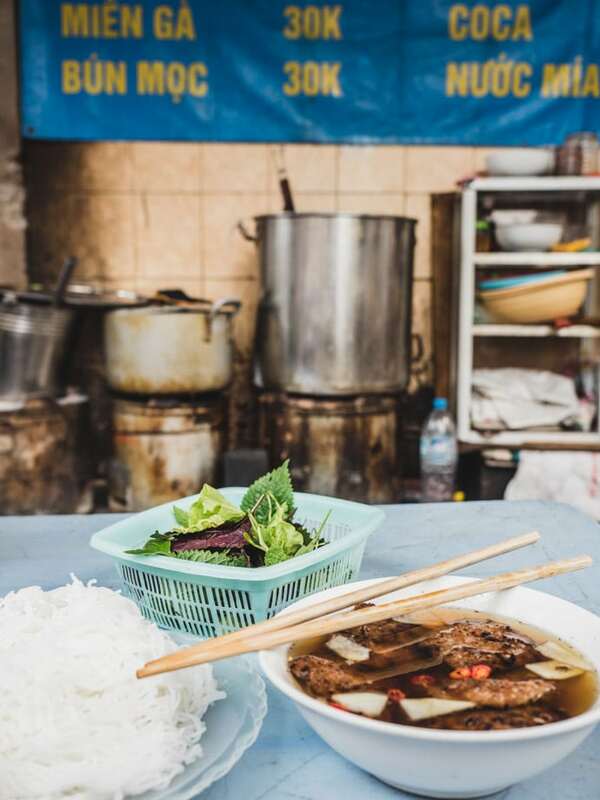 Our pick for where to eat in Hanoi to try lots of Vietnamese dishes. 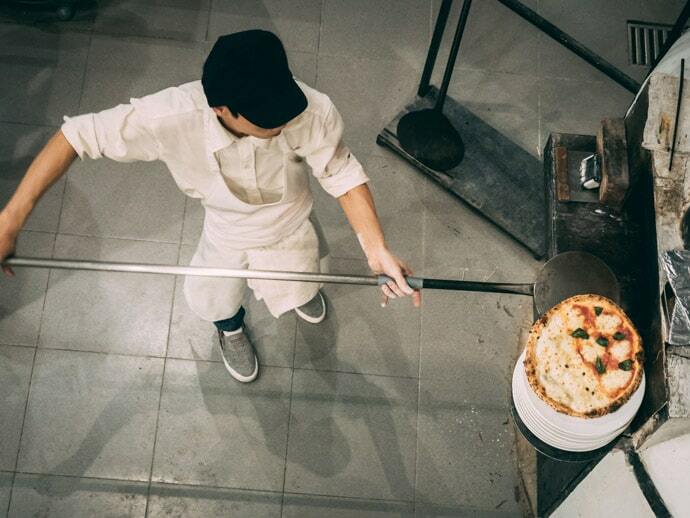 It feels strange recommending pizza in Vietnam, but trust me when I say Pizza 4P’s is more than worthy of being on this list. The restaurant is in a beautiful setting, they use their own homemade cheese, source organic produce and the best quality ingredients. And you can get dessert pizza too. Enough said. Of course, I would recommend you try as much Vietnamese food as you possibly can, but if you’re looking for a beautiful restaurant with a great concept and delicious food, Pizza 4P’s is excellent. Also in Ho Chi Minh City and Da Nang. Green Tangerine Hanoi is a Vietnamese and French restaurant in Hanoi’s Old Quarter. It has tasty food but perhaps the best thing is the beautiful courtyard to sit and enjoy your food. 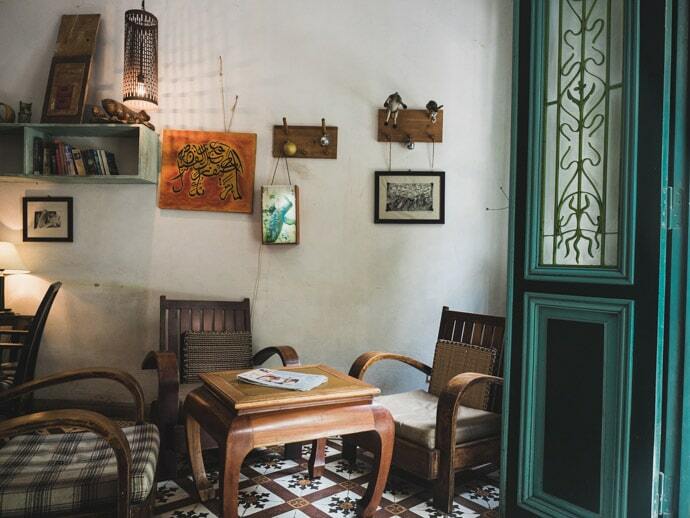 The Hanoi Social Club is one of the best cafes in Hanoi. Set on multiple levels, we loved sitting out in the sun on the roof. The food menu is varied, but mostly western food with some vegetarian and vegan options. I loved the satay chicken roti wrap. The staff here have been trained by NGO KOTO, who provide vocational skills in hospitality to disadvantaged youth. 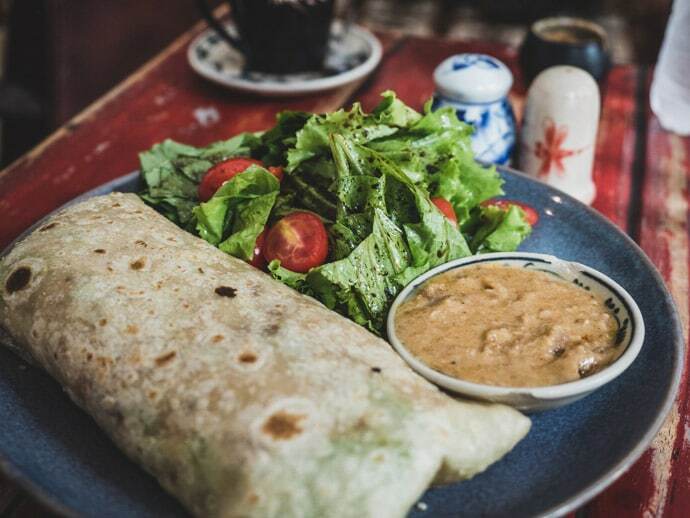 Our pick for where to eat in Hanoi for cafe style food and environment. A chain cafe in Hanoi, they have nice interiors and delicious coconut coffee, amongst other things. 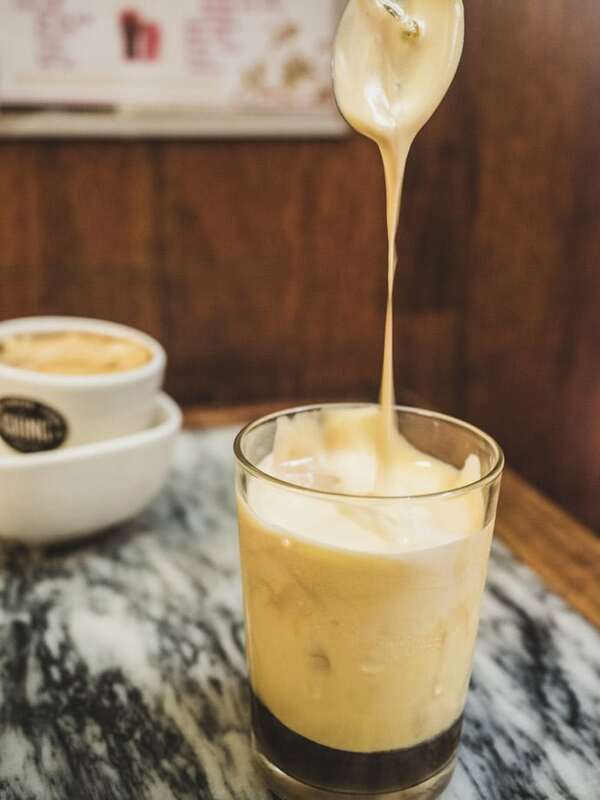 One of the best places to try egg coffee in Hanoi, both cold and hot versions are absolutely delicious, and this is coming from a predominantly tea drinker. Even though it’s not at all unknown, going through the narrow walkway to find the cafe at the back makes you feel like you’ve discovered a secret. Egg coffee with a view. Another ‘difficult to find if you don’t know where you’re going’ cafe in Hanoi. 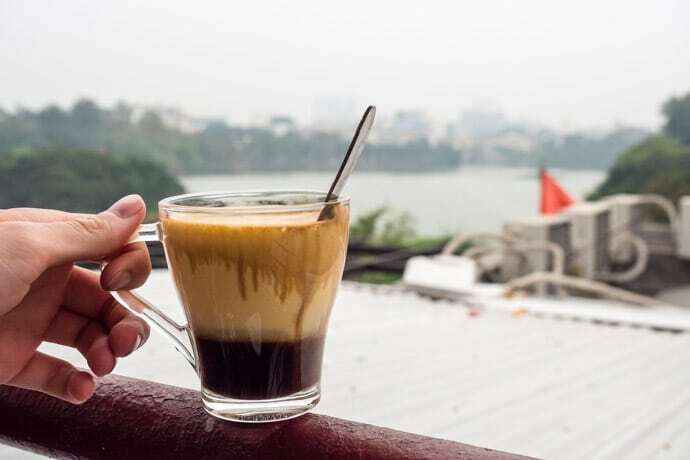 But if you seek this one out, you will be rewarded with stunning views of Hoan Kiem Lake and the rooftops of Hanoi. As well as a delicious egg coffee of course. As much as it’s like the Vietnamese Starbucks, I can’t resist their iced coffee’s and iced chocolates here. There is also a really nice Highlands with an outdoor setting by the Flag Pole of Hanoi historical monument. 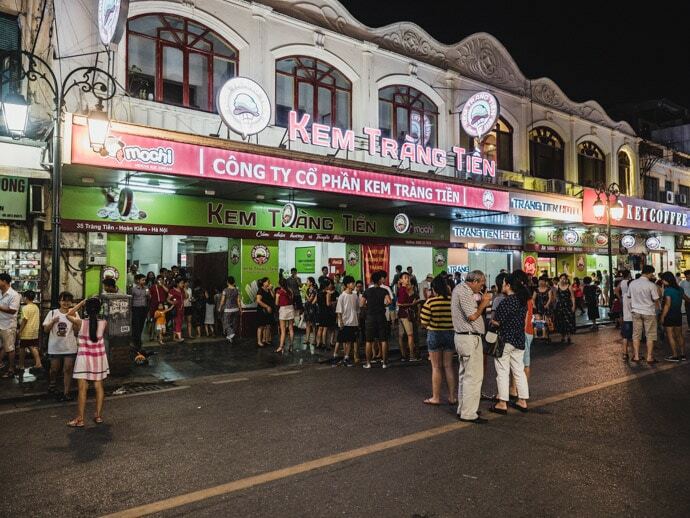 An ice cream institution in Hanoi, Kem Trang Tien is where you will find plenty of young locals lining up for their dessert, often on their motorbikes. 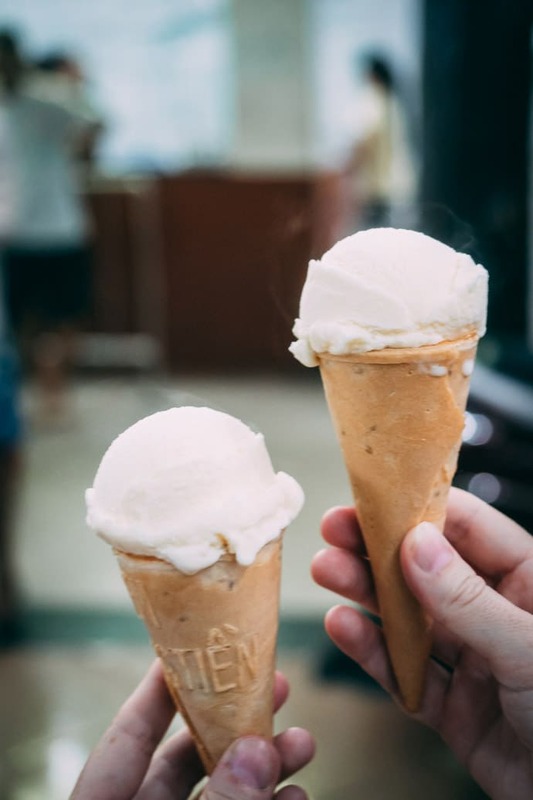 Don’t picture a pretty little ice cream shop, it’s more like a big car park with motorbikes and people…and ice cream. It’s not like the ice cream you know, it’s more of a coconut flavour and perhaps not as creamy, in a thin crispy cone. So tasty and definitely an experience worth having. A local dessert shop with little outdoor chairs to enjoy your ice cream and sweets. We loved the ice cream here and the service was really friendly. A French patisserie in the beautiful Sofitel Legend Metropole Hanoi. 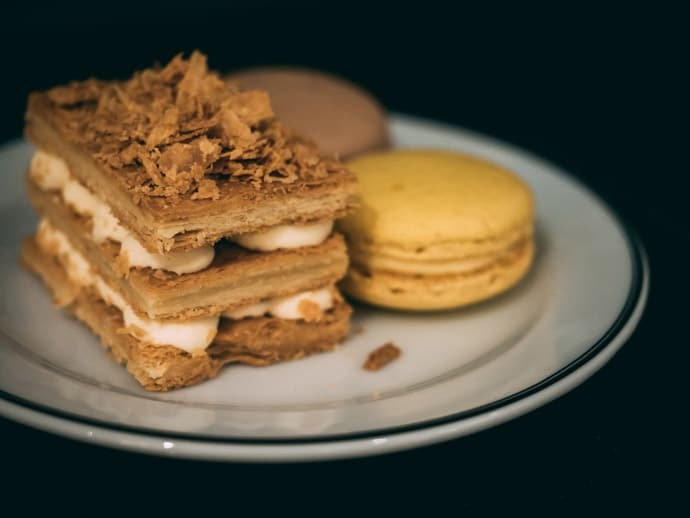 Come here for pretty desserts and to get your macaron fix. 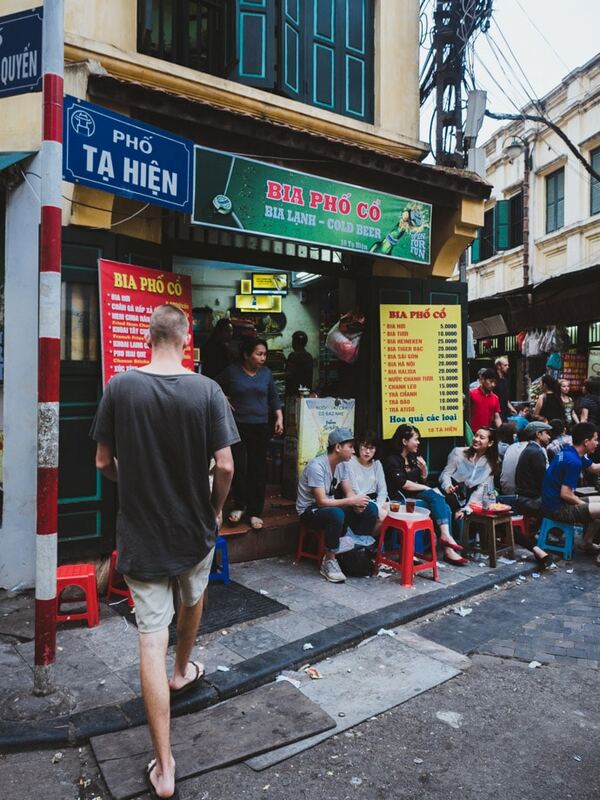 A popular corner/street with many Bia Hoi options and bars. 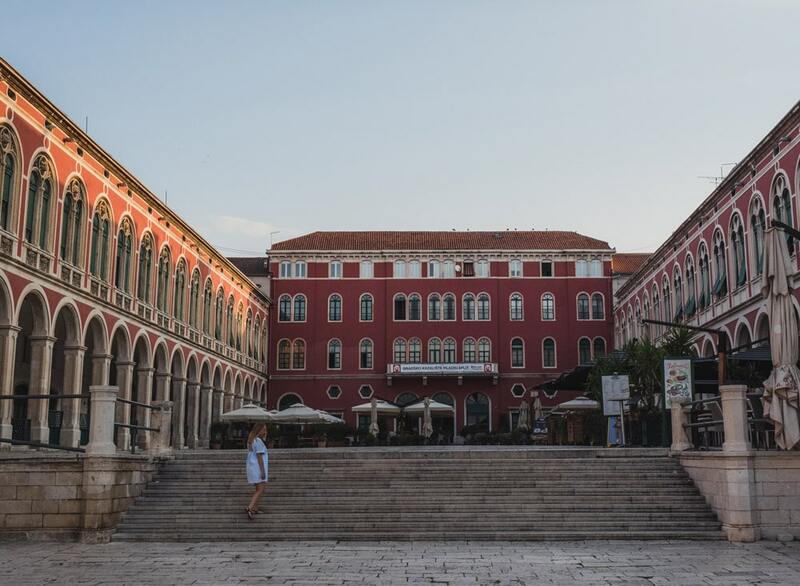 Although there are locals there too, it can be pretty touristy. 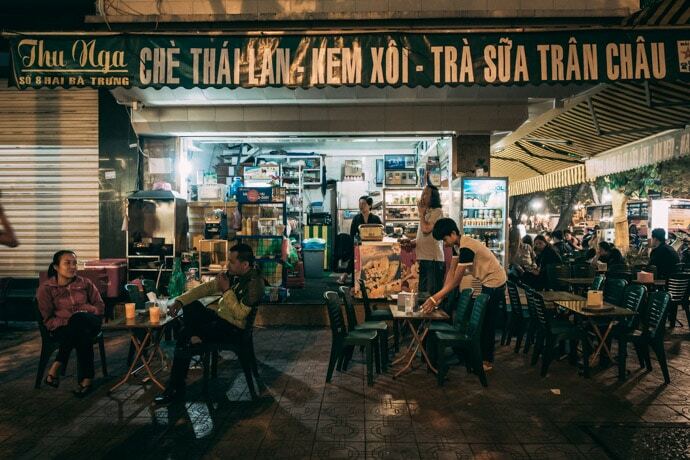 This is the hub for nightlife in Hanoi. Bia Hoi in the Ba Dinh district, near Ho Chi Minh Museum. This was our local Bia Hoi during our month long stay in Hanoi. 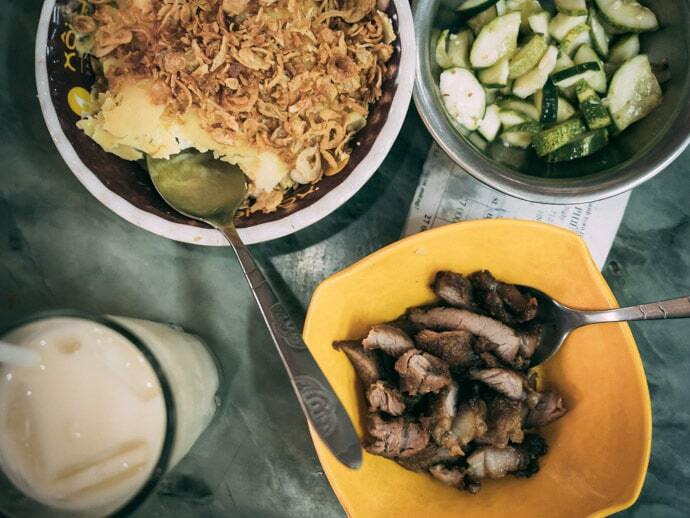 Bia hoi isn’t so much about good food, but simple dishes to snack on and fresh beer. 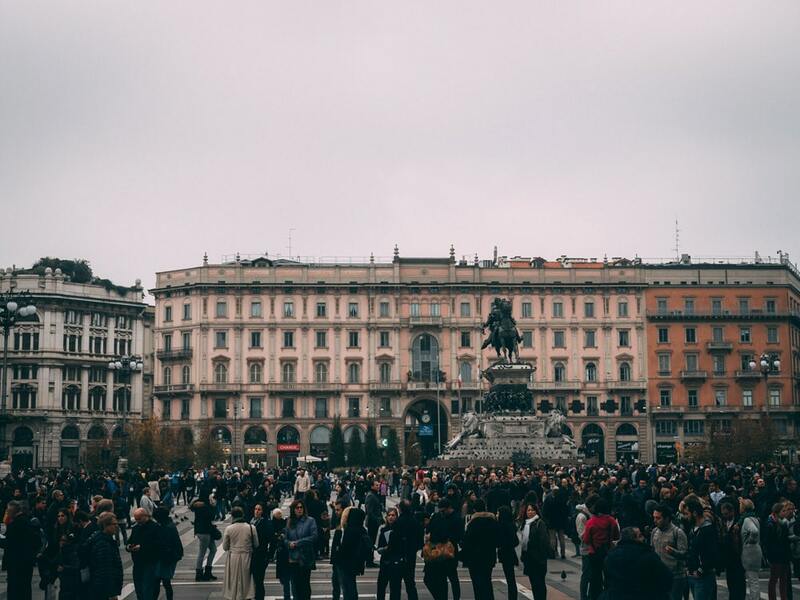 Locals gather together, the air is alive with conversations and it’s a great way to see local life. One beer is 10 000 VND (60 cents AUD). This was the first Bia Hoi place we ever went to in Hanoi. It had a great buzz and everyone was having a great night. Mainly locals when we were there which we loved. 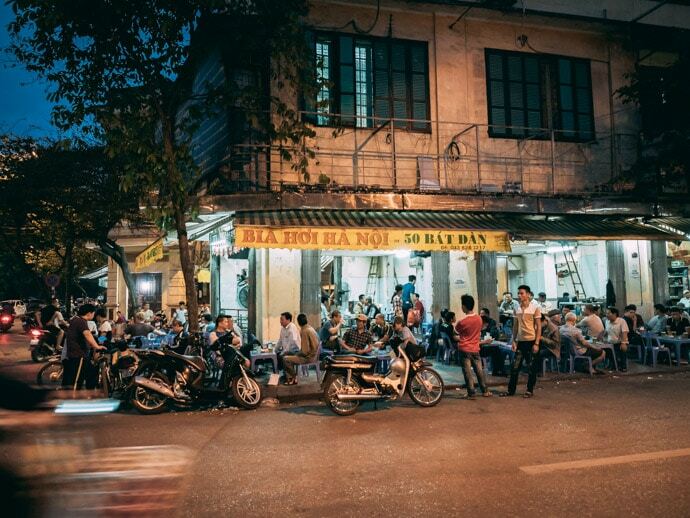 So that’s our favourite picks for where to eat in Hanoi… what’s your favourite?